The High-Speed Fiber-Optic Switch, or SW-FOP-L, uses an advanced dual sensor for edge- and hole-detect pick-ups. The dual sensor is designed to be a precision registration mark sensor with 5μs repeatability, and a standard photoelectric sensor for any high-speed application, in one package. Hole detection uses a line of light rather than a single point of light. This allows you to avoid length errors caused by the single point of light hitting an angled, curved, or shifted. Instead, the full line of light gives a wider range of detection. As soon as any part of the registration hole or notch crosses the line, the High-Speed Fiber Optic Switch registers the position. The fiber optic cables are protected by a stainless steel flexible jacket. This offers extra protection not provided with a simple fiber optic switch and is much better for industrial uses. 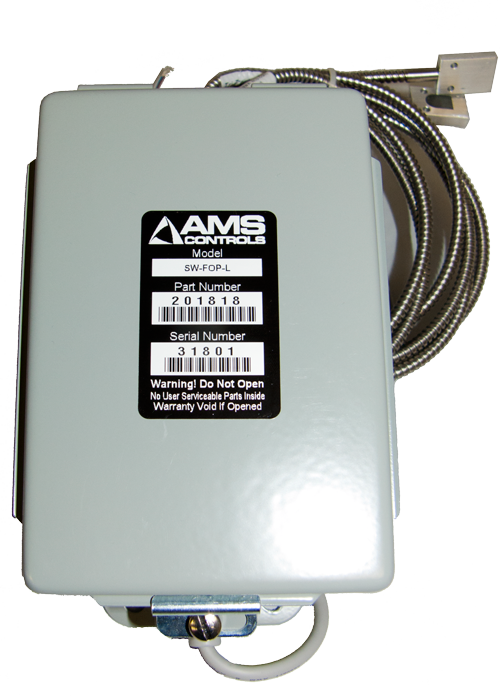 *The High-Speed Fiber Optic Switch (SW-FOP-L) is not a replacement for the Fiber Optic Switch (SW-FOP) offered by AMS Controls. The Fiber Optic Switch is still available for purchase, but should be used in slower line-speed applications.